Due to India's cultural diversity, Dussehra is a festival that's celebrated in different ways across the country. In most parts, the focus is the victory of good over evil in various forms, honoring various gods and goddesses. Here are the best places and ways to experience it. Find out more about the festival in this Essential Guide to Dussehra in India. 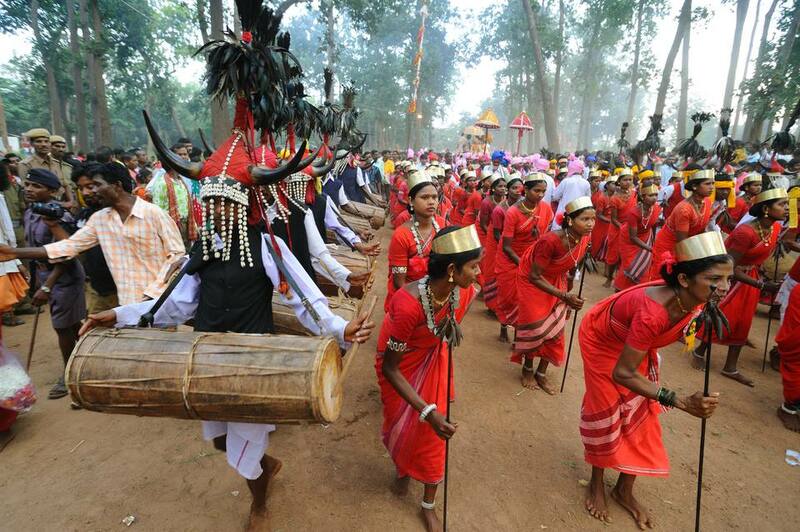 Dussehra is the most important festival in the Bastar region of Chhattisgarh. This Dussehra celebration also has nothing to do with the triumphant return of Lord Ram to Ayodhaya. Instead, it's devoted entirely to the local goddess. The festival is believed to have been started in the 15th century by Maharaj Purushaottam Deo, the 4th Kakatiya ruler of Bastar. It runs for 75 days and is often referred to as the longest festival in the world. All the region's major tribes, brightly dressed in traditional attire, are involved. Rare rituals make it particularly intriguing. Some of them are rather rigorous (such as a girl swinging on a bed of thorns and a youth buried shoulder-deep in a pit for nine days). Mediums possessed by the local deities roam eerily on the roads, and there's much energetic dancing and drumming. Numerous deities are brought from various parts of Bastar, and a massive chariot is pulled through the streets by more than 400 people as well. When: August 11-October 22, 2018. It begins on amavasya (dark/new moon) in the month of Shravan and ends on the 13th day of the bright moon (waxing phase) in the month of Ashwin. The main festivities will take place during Navaratri and reach their peak the day after Dussehra. This is from October 10-20, 2018. Where: Jagdalpur in Chhattisgarh. The town has a new airport. Stay at Kanker Palace for a regal experience or cheaper Devansh Residency in town. The world's oldest Ramlila performance has been running for nearly 200 years. It commences with the incarnation of Lord Vishnu as Lord Ram, to save humanity from demon king Ravan. The Ramilia takes place over a month every year. When: September 23-October 24, 2018. It commences on Anant Chaturdashi and ends on the full moon night around Dussehra. Where: Ramnagar, on the banks of the Ganges River opposite Varanasi in Uttar Pradesh. The main feature of Navaratri and Dussehra celebrations in Delhi is the Ramlila performances that take place in the evenings all over the city. The plays reenact scenes from the much loved Hindu epic The Ramayana. They tell the life story of Lord Ram, culminating with his defeat and burning of the demon Ravan on the tenth day, Dussehra. These days, many of the performances are going hi-tech, and have impressive theatrics and fireworks. Where: The biggest and the best shows are held in the vicinity of the Red Fort in Delhi. Mysore Dasara is Dussehra with a difference! The city's royal heritage ensures that the festival is elaborately celebrated on a grand scale over 10 days. In Mysore, Dussehra honors the Goddess Chamundeswari, a fierce form of Goddess Shakti (also known as Durga and Kali) who killed the demon Mahishasura. Mysore Palace is dazzlingly illuminated by almost 100,000 light bulbs. Numerous activities and cultural performances are held. The festival ends with a traditional procession through the streets, featuring an idol of the Goddess Chamundeshwari carried atop a lavishly decorated elephant. In the evening, there's a torch-light parade on the outskirts of the city. Where: Mysore is about three hours southwest of Bangalore in Karnataka. Another popular local Dussehra festival in Karnataka, Madikeri Dasara celebrations kick off with ritualistic karaga folk dances from four temples. The rituals are dedicated to Goddess Draupadi, an incarnation of Goddess Mariamma and wife of the five Pandava brothers in the Hindu epic The Mahabharata. The highlight happens on the ninth night of the festival, when the town is taken over by an uproarious parade of 10 hi-tech floats featuring mechanical figures of gods, goddesses, and demons. Each puts on an eye and ear-popping display, in the hope of winning a prize. The party continues well into the morning on Dussehra, facilitated by the thunderous blasting of dance music through loudspeakers. The festival used to have royal patronage, similar to Mysore Dasara, but now it's just a massive party for the people. Where: Madikeri in Coorg, Karnataka. It's about three hours west of Mysore. Effigies of Ravan aren't burned at this week-long Dussehra festival either. On the first day, Goddess Hadimba is carried from the temple in Manali down to Kullu, where she's taken to the palace and blessed by the royal family. She then goes to Dhalpur and is joined by the idol of Lord Raghunath (Lord Ram, the presiding deity). Hundreds of gods and goddesses from all over the region come to meet them, and they're carried in procession to Dhalpur Maidan where they stay until the end of the festival. The fair grounds are alive with exhibitions, cultural performances, and vendors from across India. On the last day, the chariot is pulled to the Beas River, where a pile of thorn bushes is set on fire to depict the burning of Lanka. Where: Dhalpur Maidan in the Kullu Valley of Himachal Pradesh. The highlight of this Dussehra celebration is a huge fair (mela) with a rural feel. Artisans come from far and wide to sell their wares, and there are cultural programs and performances. Villagers also gather in traditional dress to offer prayers to Lord Ram and to celebrate his victory over Ravan. Towering effigies of Ravan are burned. In addition, there's a captivating procession from the Royal Palace to the fair ground, featuring decorated elephants, camels, horses, folk dancers. The fair takes place alongside the Kota Adventure Festival, which is held on the Chambal River. Activities include parasailing, rafting, wind surfing, water skiing and kayaking, rock climbing, gliding, trekking, angling and rural excursions. When: October 18-November 5, 2018. Where: Kota is in southeast Rajasthan, about an hour from Bundi. The very unusual 10-day Dussehra festival at 300 year-old Mutharamman temple, in Tamil Nadu's Kulasekarapattinam village, requires pilgrims to dress up as gods and goddesses (or animals!) of their choosing. The temple is dedicated to ferocious Goddess Kali. Devotees channel her spirit and dance in a volatile throughout the night, holding flaming clay pots in their hands. The festival culminates with a theatrical slaying, on the beach, of demon Mahishasura by the Goddess. It's definitely on of the most astounding spectacles in India! Where: Kulasekarapattinam, about an hour and a half northeast of Kanyakumari in Tamil Nadu. Tiruchendur, 20 minutes north of Kulasekarapattinam, is the closest place to stay. Special trains run to Tiruchendur from major towns and cities in Tamil Nadu, and special buses go from there to the festival. On Dussehra, the mountain streets of Almora are overtaken with a motley assortment of villains from The Ramayana. They're made by local groups and paraded across town before being set ablaze by the crowd. 33 effigies of Ravan's family members are burned. Where: Almora is located in the Kumaon region of Uttarakhand, about an hour and a half from Ranikhet. The nearest airport is in Pantnagar, about four hours away. The nearest train station is in Kathgodam, about three hours away (however, disembark at Haldwani for greater public transport availability).